The liver is the major site of drug metabolism in the body, with well over 50% of marketed drugs being eliminated via hepatic mediated metabolism. Hence, measurement of the rate of clearance and the identity of the metabolites of a drug is important. 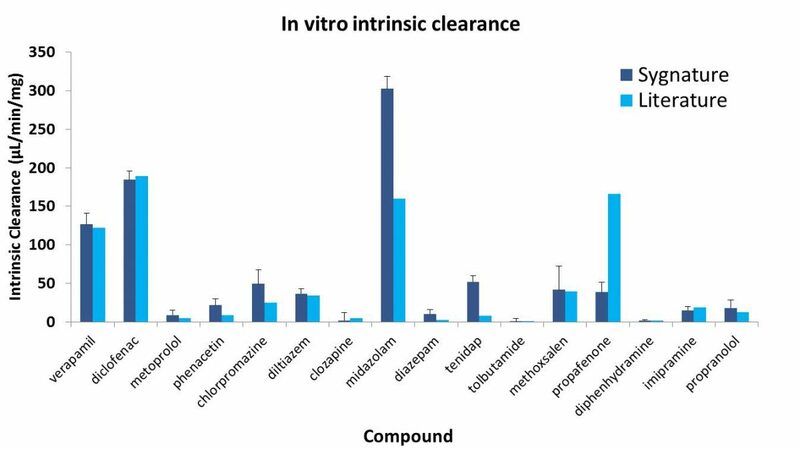 In addition, in support of projects, the rate of clearance values can be used to rank compounds and to predict in vivo hepatic clearance values. Microsomes from a variety of species and tissues can be used to understand inter-species differences and non-hepatic metabolism. Sygnature’s standard microsomal metabolic stability assay utilises the Phase I cofactor, NADPH. We can also offer a combined Phase I/Phase II assay, utilising NADPH and UDPGA to determine both Phase 1 and Phase 2 (UDP-glucuronosyltransferase (UGT)) metabolism. For the latter, these are accessed by pre-incubating the microsomes with the pore-forming agent, alamethicin. Sygnature’s microsomal stability assay monitors the disappearance of a compound in the presence and absence of cofactor. All assays have two replicates per compound and are validated by the inclusion of up to 3 species-specific control compounds. Data output consists of mean intrinsic clearance and half-life measurements. Figure 1 In-house intrinsic clearance values compared with published data. Data shown are the mean ± standard deviation of 3 or more replicates.